Ahhh… the time has come! 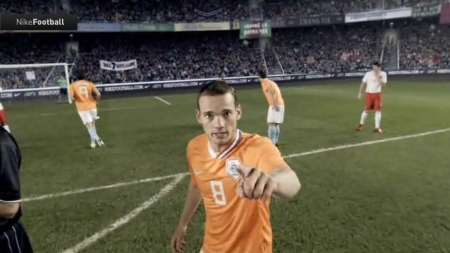 The moment all of us footy enthusiasts have been waiting for: the new Nike soccer commercial. When it comes to the beautiful game, Nike’s marketing department has never failed to impress us; this time they have really pushed the boundaries of creativity, adapting a unique first-person view. You open your eyes. You see the referee has just finished booking the defender that brought you down. One of your teammates helps you up, and asks if you’re alright. “Can you take it?” he says. “Yeah yeah don’t worry about it” you reply, and carefully place the ball on the free kick spot. Not even waiting for the referee to blow his whistle, you slam an inswinging shot past the ball straight into the net. GOAAAAAL!! Your teammates jump all over you, you’ve just won the game for your team! 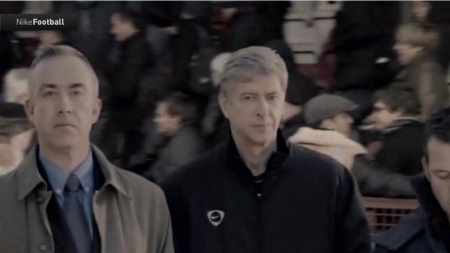 As you exit the field, you spot Arsène Wenger eyeing you from the sidelines. Looks like he’s scouting for some new talent… could you be the next promising youngster heading to Emirates Stadium? As you enter the door of the training ground, you can’t contain your excitement at receiving your fully personalized Arsenal jersey. 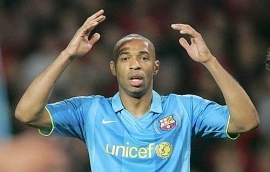 The assistant coach points to your spot in the changing room, between shirts nº32 (Theo Walcott) and nº2 (Abou Diaby). Time for your first match, Arsène is bringing you on against Manchester United!! William Gallas high fives you as he leaves the pitch; a slap on the cheek from the Gunners captain is all the encouragement you need! It doesn’t take you very long to get right into the heart of the action! Wayne Rooney chests the ball and volleys it towards Cristiano Ronaldo. You somehow try to stop him but you just get pushed to the ground. Boy that’s gonna leave a mark! Before you can even get back up, you see the Portuguese player making a fool of your keeper and scoring with a slamming volley. 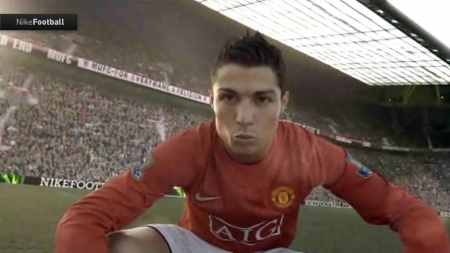 After his goal, Ronaldo doesn’t miss taunting you for your incompetence, that was embarassing! Enraged at your first match performance, you’re boiling with energy at your next training session. Push-ups, sit-ups, jumping, running up the stairs, you’re really pumped and ready for action. After a long spell on the bench, Wenger has decided it’s time to give you a second chance: you’re a starter in Arsenal’s next league game. No time to waste, kick-off and let’s go!! You pass the ball to Cesc Fàbregas, he gets by a defender then slides the ball to the right wing. With the cross is coming in towards you, you cannot miss it this time! Waiting for the ball to drop, you arm a powerful volley past the opposing keeper!! GOAAAAL!! 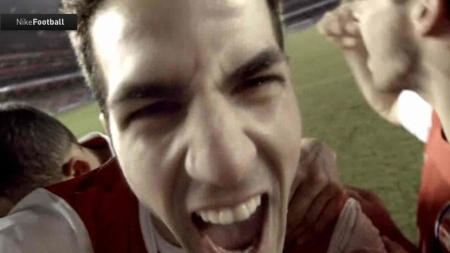 Fàbregas kisses you and screams like a little girl with excitement. From the kisses of Fàbregas to that of your girlfriend. You’re transported into a limousine, ready to attend some big fundraising event. It’s a drag, but you know it’s for a good cause and besides, you love the media attention. Champions’ League day! Arsenal are playing Inter Milan. You’re facing Marco Materazzi, challenging an aerial ball. The Italian defender doesn’t play subtle however, and shoves you aside before heading the ball to Zlatan Ibrahimovic. 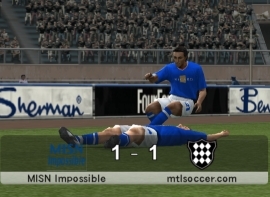 Darn, that Materazzi challenge really left some bruises. As you take your shower after the match, you discover you’ve lost a tooth! Next week, you’re playing Barcelona. The traditional pre-match handshakes see the Blaugrana players pass by before you…Rafael Márquez, Bojan Krkic, Ronaldinho… then game on! Receiving a pass, you chest it down and flick it over a defender, before attempting to send it down the right wing… but Marquez intercepts it!! He passes to Ronaldinho, and the pesky Brazilian makes your teammates look like fools… two sombreros in quick succession? 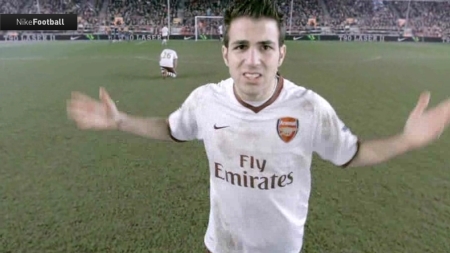 Cesc is not happy! Back to more training, even harder this time!! More running up the stairs… but also team spirit building: you pull down the pants of one of your teammates during practice. Everyone bursts out laughing as the joke recipient chases you angrily. It’s all in good fun though. Then more running… so much in fact that you end up puking your lunch when you’re done. It was worth the effort though, the Dutch national team manager has monitored your progress and called you up for your first international match vs. Portugal!! 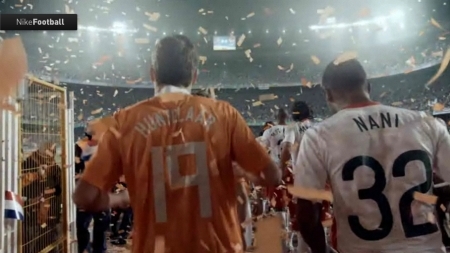 Your heart is pacing at 200 beats per minute as you enter the stadium, right behind Klaas-Jan Huntelaar and Nani. Boy oh boy are you excited! Some pre-match stretching, Ruud van Nistelrooy does a few juggles & flicks, then hands the ball to the referee. The match can begin!!! Kick off, your team is taking control. Ruud attempts a long-range drive but it’s parried by the keeper. He apologizes for messing up your good pass. Oh look it’s Ronaldo again, only this time you’re not letting him school you. Alright I’ll quit teasing you… here’s the video (you can find the high res version at Nikefootball.com). 33 years of age and match-winner for Manchester United in the return leg of the UEFA Champions League Semi-Finals vs. Barcelona. Paul Scholes the gladiator. Paul Scholes the veteran. Paul Scholes the long-range specialist: his 14th minute strike from 25 yards (after a messy clearance by Zambrotta) was the only goal of the night, as the Red Devils advance to Moscow for the first ever fully Premiership-coloured Champions League final in the tournament’s history. Sir Alex Ferguson may have been criticized for his overly defensive tactics in Europe, but in the end, who can blame him for his achievements? His team has conceded only 1 goal in the entire knock-out round of the competion (the 1-1 away match to Lyon), and has qualified for the tournament final. People have often criticized Italian clubs for playing defensive football, but it works. As AC Milan manager Carlo Ancelotti once said: “If you want entertainment, go to the cinema”. ‘Nuff said. Tactically, Sir Alex Ferguson was dealing with two very big problems at the start of tonight’s match: no Nemanja Vidic, but more importantly no Wayne Rooney. With the young striker picking up a muscle strain in the match vs. Chelsea last week-end, the United manager was forced to change his tactics a bit and field a 4-4-2 formation, with Cristiano Ronaldo and Carlos Tevez lone strikers and Owen Hargreaves once again in the right-back position. On the other end, Barça coach Frank Rijkaard stuck to his original plan: no Thierry Henry (benched), striking trio formed by Andres Iniesta, Samuel Eto’o and Lionel Messi, just like in the first leg. To be perfectly honest, as the match started the first few minutes of weren’t exactly promising. 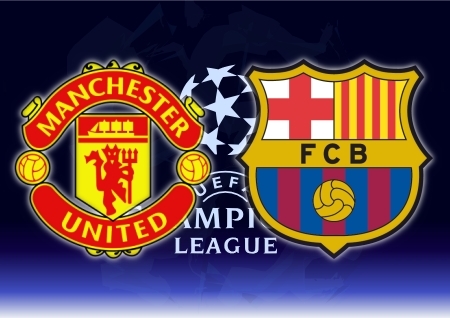 Tension and anticipation were big for this one, but much like the first leg at the Nou Camp both teams were “afraid” of pushing forward too much, in particular the Red Devils who had to avoid the dreaded “away goal” at all costs. However amidst all the prudence, there was one player who seemed to be saying: “Screw this, I came here to play some attacking football” and that player was Lionel Messi: his constant runs and accelerations gave considerable trouble to the United defense initially, until minute 14 struck. Recovering the ball on Barcelona’s right wing, Gianluca Zambrotta felt pressured and attempted to clear towards the center. His low pass was however intercepted by Paul Scholes about 30 yards from goal, and the former England international took little time to think where he was going to put it. Slamming shot and whammo, into the top corner with Victor Valdés helpless. 1-0 Man Utd and exactly what Sir Alex was looking for: an early goal. Scholes’s tally certainly did its part in “waking” the game up, both on the pitch and on the stands, where the 70,000+ Red Devils fans started chanting at the top of their lungs. Galvanized by the crowd and the momentum gathered from scoring, the United players continued to push forward and came very close to extending their lead (through Nani and Ji-Sung Park notably). By the end of the half however, the Blaugrana had taken the upper hand and were keeping Edwin Van der Sar occupied: the runs of Eto’o and Messi, coupled with technique of Deco came dangerously close in giving the catalans the equalizer, especially through the long shots of the Brazilian-turned-Portuguese midfielder (narrowly wide of the post). Despite Barcelona’s best efforts however, the match went to break with Man Utd in the lead. In the second period a somewhat invisible Cristiano Ronaldo decided to wake up a little, and get a little bit more involved in the Red Devils’ offensives. The real thorn in the Barça side was however his Portuguese colleague Nani, constantly provoking his markers with fakes, dribbles and accelerations (much like Ronaldo should have been doing but couldn’t, due to the close man-marking presence of the two catalan center-backs). At the hour mark, with Barcelona still unable to muster any significant scoring chance, Rijkaard finally decided to play the Thierry Henry card (on for Iniesta), shortly followed by that of Bojan Krkic (on for an unimpressive Eto’o). Ferguson replied by removing Nani and Scholes and inserting Darren Fletcher and veteran Ryan Giggs. As the clock was getting closer and closer to the 90th minute mark, the tension on the pitch proportionally increased. The two Barcelona substitutes tried their best to justify their insertion on the field, but with little luck. 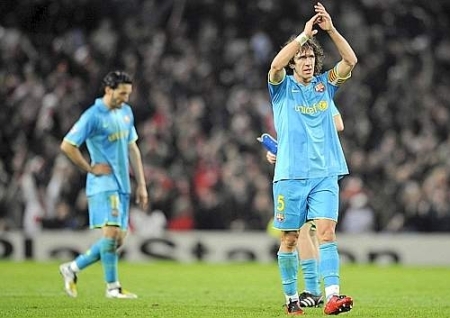 Even the added presence of Eidur Gudjohnsen (on for Yaya Touré) in the final minutes was insufficient, as the Blaugrana were still helplessly unable to pierce through the United defense. Eventually the referee called full time and the entire Old Trafford stadium erupted with joy, as their team will be travelling to Moscow final on May 21. It will be the first ever UEFA Champions League final opposing two English clubs, and the first final for the Red Devils since their 1999 triumph vs. Bayern Munich. For Barcelona, tonight’s elimination marks a decidedly failed season for Frank Rijkaard, whose tenure as club manager is now likely damaged beyond repair. MANCHESTER UTD (4-4-2): Van der Sar – Hargreaves, Brown, R.Ferdinand, Evra (92’ Silvestre) – Nani, Carrick, Scholes (77’ Fletcher), J.S.Park (77’ Giggs) – C.Ronaldo, Tevez. (bench: Kuszczak, O’Shea, Anderson, Welbeck). Coach: Ferguson. Based on Gazzetta’s info, there are currently 22 Italians playing in first divisions abroad, and 11 of them stepped on the field this week-end. “Only” one goal for Luca Toni this time. Yeah that’s right, his April average drops: we’ve been so used to Italian Bayern doubles lately that scoring one appears sorta appears like a “downgrade”, doesn’t it? That’s nº21 in the Bundesliga for the ex-Fiorentina striker, and needless to say he’s topping the goalscoring charts (2nd-ranked Mario Gomez is trailing by 6). As for Fabio Grosso, after his goalscoring performance vs. Strasbourg last week, bad stuff from the Lyon winger this week-end. Everything started well though: one assist for Karim Benzema, and Lyon up by one in the 34th. Shortly after however, some mistakes by the home team’s defense (Grosso included) led to the equalizer by Juan Eduardo Eluchans and 1-2 goal by Lilian Compan, and our favorite World Cup 2006 hero even got a yellow card in the process. Then during the half-time break, a slap on Yoan Gouffran (who had grabbed Grosso by the shoulder) was caught by the referee and resulted in a direct red for the Italian. Here are the results and summaries for matchday 35. Full Video Highlights here. I apologize for the lack of full match reports this week-end but… I was otherwise occupied and hung over, I’m sure you’ll all understand. 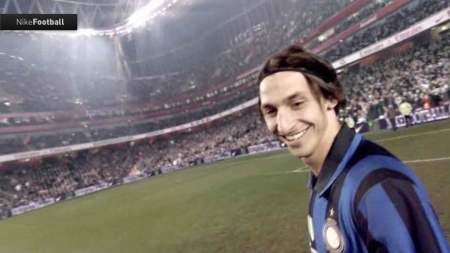 MILAN, 27 April 2008 – Inter are now just a step away from the Scudetto. 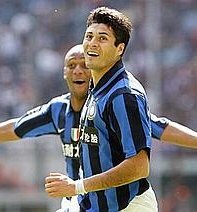 At three games from the end of the season, the Nerazzurri have still 6 points over Roma thanks to their 2-1 win against Cagliari, courtesy of Julio Cruz and Marco Materazzi (the Sardinian side could only reply through Davide Biondini’s consolation goal). Not very useful for Roma and their 4-1 win over Torino, where Gianni De Biasi picked up his second defeat as manager of the Granata. David Pizarro opened the score, Mirko Vucinic and Amantino Mancini (2 goals) completed the job before Nicola Ventola had a chance to score in the second half for Torino. Roma finished the game with ten players after Juan was sent off. JUVE IN CHAMPIONS LEAGUE – However, Roma hold strong over Juventus. The latter have secured today a spot in the Champions League with their 5-2 win over Lazio. Giorgio Chiellini opened the score for the bianconeri after 33 minutes of play, followed by Mauro Camoranesi, Alessandro Del Piero, David Trezeguet and another goal by Chiellini. Lazio came out more energised in the second half, as shown by Rolando Bianchi’s and Sebastiano Siviglia’s goals, but it was too little too late for the Biancocelesti who had to finish the game with 10 men, after Siviglia picked up his second yellow for a foul on Pavel Nedved. MILAN CLOSE – The race for 4th place is getting closer and closer as we approach the end of the season: four teams are within a margin of 6 points. Fiorentina‘s match against Sampdoria ended in a draw, with Bobo Vieri and Adrian Mutu scoring to neutralise in just six minutes (33′ and 39′ of the second half) the initial advantage achieved by Christian Maggio for the Blucerchiati. Fortunately for Sampdoria, Daniele Gastaldello’s header in stoppage time gave the visitors a valuable point from the draw. Fiorentina’s tie was a beneficial result for AC Milan, victorious 4-1 today in Livorno with an inspired Filippo Inzaghi scoring three goals: Super Pippo now has a record goal average, with 8 goals in the last 4 games. 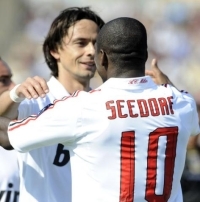 Clarence Seedorf also contributed to the rossoneri score and Dario Knezevic is the author of Livorno’s only goal today. Antonio Di Natale and Fabio Quagliarella scored for Udinese and Juan Manuel Vargas’s goal wasn’t enough for Catania today. But the fight for a place in European competitions is not the only one in the standings: at the bottom, a few teams are still fighting for survival in Serie A. AT THE BOTTOM – Livorno is alone at the bottom of the standings, while Reggina moved ahead of Parma – now second last – after this week’s game. Luca Cigarini opened the score for Parma but in the second half, Massimo Paci was sent off for the Gialloblu and Francesco Cozza led his team-mates to victory with his two goals. A breath of fresh air for Empoli, who only needed a great play by Ignazio Abate to take over the “Marassi”, defeating a Genoa side that finished the game with 10 players due to Marco Di Vaio’s expulsion. 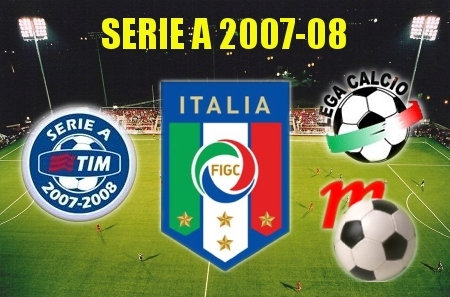 But the Tuscan are still far from their final goal: the last 7 teams are within a margin of 5 points. This week-end’s goalless games were Palermo-Atalanta and Napoli-Siena. This week, the goal-of-the-week award goes to Alessandro Del Piero. I’m throwing objectivity right out the window this time, and siding with La Domenica Sportiva. The Juve captain’s run, dribble, and left-footed finish against Lazio is the culmination of an absolutely stunning season by Del Piero, one that a certain Azzurri manager can no longer ignore. 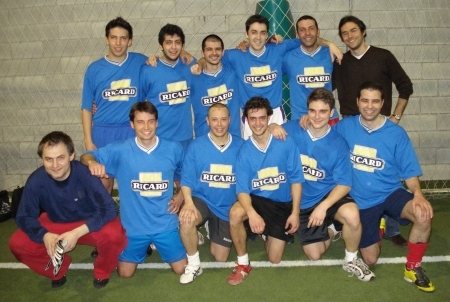 On Saturday April 26th we played game the FINAL game of the Winter 2007-08 Lachine indoor league, vs. mtlsoccer.com. Here we were. After a 7-month-long season of intensive indoor soccer performances, our team had made it to the PLAYOFFS FINAL! For MISN Impossible, this was essentially the time to redeem ourselves. We had started the Division 2 season with big aspirations, convinced to repeat our Division 3 glories the previous year and rank at the top of the regular season standings. 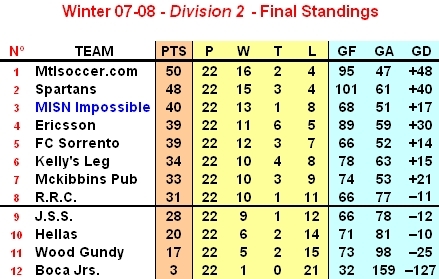 Unfortunately (as I mentioned too many times already), mid-season injuries coupled with some very poor performances had cost us a considerable amount of points, so many in fact that in the end, we could only manage to rank 3rd in the final standings (behind champions mtlsoccer.com and runners-up Spartans). 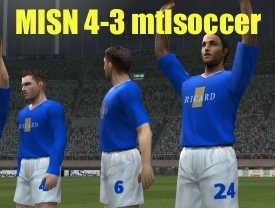 Our opponents for the big final were mtlsoccer.com, none other than the regular season Division 2 champions. Finishing the year with 50 points (16 wins, 2 draws, 4 losses), as well as a goal differential of +48 (95 goals scored and 47 conceded) and the best defense of the season, our opponents were looking strong and we were undountedly in for a big challenge. Especially because our previous two encounters had both finished to the advantage of our opponents: we were defeated 3-4 in the first match (a freak game during which 3 of our players got injured, and where we had to finish the match 5 vs. 7) and 0-4 in the second (a match where we played so badly I was too depressed to even write a game report). However despite match history favored our opponents, recent form put us at a slight advantage. We had not lost a single game since that famous 0-4 back in February, while in contrast, our opponents had to resort to penalty kicks in order to advance from their Semi-Final fixture. As a result, it was anyone’s game for the big final… but we wanted it more!!! Attendance-wise, no change since our first playoff match. Kevin was still out with a wrist fracture, Santi still had not recovered from damaged knee ligaments and Eric had left town for an out-of-province Summer job (besides, he too was out injured still). Fortunately however, everyone else reported for duty for the big game. Marco was back from suspension, Tim got rid of his work obligations, and we even had the last-minute surprise to see Danny present, as our Québecois wing-back postponed his flight to Miami for one day in order to play in the final game. That’s the MISN spirit!!! We started the game with 8 players actually because, get this, one of the car groups (Marco, Can, and Danny) had to drop by Tevin’s place in order to return the Division 3 trophy from last year. Yeah, that’s Tevin’s new place all the way over in Bleury & St. Hubert!!! Fortunately, we arrived only 5-10 minutes late, with the game score still tied 0-0. In the initial minutes of the match we had good ball possession throughout, passing the ball quickly, opening up on the wings, and shifting the ball back when necessary. Unfortunately despite our good plays forward, mtlsoccer scored on the first big opportunity they had, really, as we paid the price for not closing down their strikers sooner. Dribbling with the ball from the midfield line one of the mtlsoccer players advanced forward, faked a pass to get by one of our defenders, then got within 15-20 yards and executed an accurate left-footed instep towards Jan’s left post. Our keeper couldn’t reach it, and it was 0-1 after only 10 minutes. Tough break, but this was only the beginning. We continued to move the ball around, creating space with our quick overlaps and putting our players in good position to create danger. The through passes between Nafee, Can and Saber notably were keeping the mtlsoccer defense on their toes, and the added support of Alex, Danny and Marco on the wings gave us additional solutions where to pass the ball. Saber, Can, and Marco tried their luck from distance a few times, before we finally pulled through the mtlsoccer defense and re-established the tie. A good passing combination on the left side between Nafee, Can and Bardia (I think?) ended up with the ball being passed across goal, and as a mtlsoccer defender tried to intercept it, he ended up clearing it into his own net! 1-1!! Following our goal we were really carried forward by momentum, as our opponents were being pressured back into their own half. Sometimes their strikers would occasionally pierce through our midfield (and put our defense and Jan in tricky situations) but we generally got the best of them. 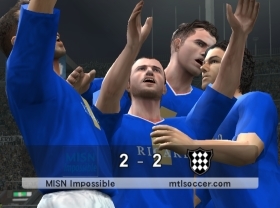 Meanwhile however, we continued to pound on the mtlsoccer goal, getting successive scoring chances that were kept out of the net by sheer luck (for our opponents!) alone. We must have hit the post like at least 2-3 times, and every time the mtlsoccer defenders managed to clear the danger before we could go for the winning tap-in. The half thus ended on a 1-1 scoreline, with everything still left to play for in the second period. We were playing well however, our movement and passing had made us dominate the first 25 minutes, so all we needed to do was keep up what we were doing, and perhaps pay a little more attention in defense. In the second half we really got things going, multiplying our runs and offensives at the opposing goal. On a few counter-attacks notably, we had what can only be defined as “golden chances” to get in the lead, in particular through Tim and Bardia. On the first chance, a great turn-over run by Tim brought him to exchange passes with Can on the right wing, and receive the return pass wide open in the center (the control, turn, and poked flick by our Turkish striker was awesome by the way), but Tim‘s one-time finish towards the bottom-left corner was deflected into touch! Minutes later, another good Can pass from the right wing set up Bardia in front of the goal (all alone, 5 yards out!) but our Iranian playmaker’s finish was over and wide!!! In his defense, Can’s pass was bouncing and hard to hit one-time, but what a huge miss that was! With all these missed chances, one had to wonder if we weren’t going to be biting our nails later on. We almost did in fact, as mtlsoccer started hitting back and create a few opportunities of their own. On a scramble following a set pieces, they even managed to hit the post before our defense cleared the danger, but otherwise we were really starting to feel the pressure on counter-attacks. Nafee got even very close to being sent off, as he tripped one of the mtlsoccer players from behind during a breakaway, and almost picked up his second yellow card of the game. MISN dodged a big fu**ing bullet right there. Our worst fears were however realized in the final 5 minutes, when Jon attempted a dangerous dribble, lost the ball in offence and set up the mtlsoccer counter. Getting loose on the left wing, one of their strikers managed to make a run all the way to the edge of our box, and put the ball across in the middle. Trying to intercept it, Jon ended up deflecting it into Jan’s net, leaving our Slovakian nº1 helpless. 1-2. We were speechless. Having dominated the entire game, we were now trailing by one with less than 5 minutes to go, because of a stupid mistake. However this was no time for a mental collapse, and even with a few minutes left to play we needed to try. We subbed off our defensive players, leaving only 2 defenders at the back and pushing everyone else forward. These were really the final minutes, so there was not much we had to lose. Just when we were thinking of substituting Jan for an extra field player, we finally caught a break!!! On the developments of a corner-kick from the left side, the ball bounced back and forth, eventually landing towards Bardia right in front of the goal. Before the ball dropped to the ground, our Iranian playmaker somehow managed to get a touch on it with his foot (call it a new Persian kung-fu technique or something) and send it past the goalkeeper’s arms into the net!!!! With less than 30 seconds to go, we had managed to tie the game 2-2!! The referee called full time practically right after, sending the game into a one-half 5 minute overtime! We had momentum back on our side now, so it was time to go for the kill. Unfortunately though, not much happened in the ensuing 5 minutes of extra time, and the game eventually proceeded to PENALTY KICKS. Winning the coin toss, mtlsoccer decided to shoot first (and remember: in Lachine matches there are only 3 kickers, not 5). The first shooter for mtlsoccer stepped up, and it was a player who had been complaining the entire match. We had the feeling the badmouthing was going to come back to haunt him… and it did!! His low strike on the ground was off the mark and wide!! Still 2-2!! Can stepped up to take the first kick for MISN… and scored towards the right, sending the keeper the wrong way! 3-2! The second mtlsoccer shooter stepped up, their nº9 player (who had played a very good game, running everywhere and dictating pace). Keeping his cool, he sent the ball towards the top-left corner. Jan had dived the right way, but couldn’t reach the shot. Goal. 3-3. Our second shooter was Alex, and just like Can did for the first shot our player sent the keeper the wrong way, this time shooting towards the left. Goal!! 4-3!! The last shooter for mtlsoccer had a big weight over his shoulder, and from his run we could tell he wasn’t exactly radiating confidence. Short run, shot… wide!!!!!!! 4-3 and game over!!!!!!!! 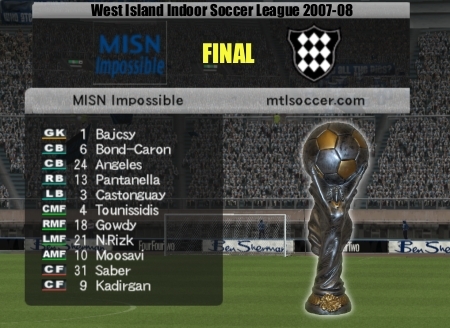 MISN Impossible were Division 2 PLAYOFF CUP CHAMPIONS!!!! Awesome come-back boys, a victory in pure MISN-style! I really wish one of these days, that we’d manage to win a cup without going through all the drama, but I guess that is… impossible! We have really chosen our team name well huh? I’d like to thank everyone for your participation, contribution, and efforts to the cause! Some of us got lost on the way due to injuries and various other reasons, but this victory today is as much yours as it is ours! After a rocky regular season we have proven that in the end, we were the better team. We just lacked a little bit of consistency that’s all. For those of you who aren’t staying in Montreal in the coming months, have a great Summer (particularly Danny, who has been given the mission to create a MISN-branch down in Miami, Florida) and be sure to come back visit us some time. For all the others, I’ll be seeing you soon for the Summer league! Take care guys, and long live MISN! !